$150. 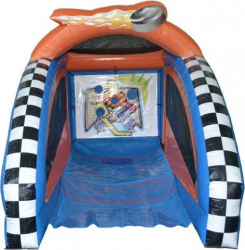 Shoot and score with the Mini Hockey Game interactive inflatable! It is the perfect inflatable game for your party (birthday, graduation, celebration, summer barbecue, etc) business or bounce house rental business. Grab a friend to slap some pucks into the inflatable net. See if you can score stick side, glove side, five-hole or top shelf where mama hides the cookies! The Mini Hockey Game is best suited for older kids and adults. Measures 12x9x10 with 1 hp blower.